A cooperative turtle rehabilitation programme, under the umbrella of the Wildlife Protection Office has been running since 2004 in Dubai. Debilitated turtles are initially treated by Al Wasl Veterinary Clinic, and later husbandry is provided by the Burj al Arab Aquarium team. Final-stage rehabilitation is conducted, partly as a public awareness programme, within the Madinat, Jumeirah waterway complex. Species received by the rehabilitation project include both Green (Chelonia mydas) and Hawksbill turtles (Eretmochelys imbricata) of all sizes. Reasons for presentation range from post-winter debilitation to severe physical injury. Green turtles are distributed throughout tropical areas of the Atlantic, Pacific and Indian Ocean. They are found in the Arabian Gulf and nest in large numbers in Oman. Adult Green turtles, can reach a maximum weight of up to 160kg and a maximum straight and curved carapace length of between 88-117cm. Adult Green Turtles are herbivorous and commonly feed on sea grass and algae. Juveniles are omnivorous feeding on fish, molluscs, crustaceans and sponges. On 12th March 2008 a 30kg sub-adult Green turtle was found floating off ‘Palm Jumeirah’, Dubai. It exhibited strong positive buoyancy and had sustained a large plastron fracture as well as several injuries to the head and carapace (Fig 1). Wounds were washed with povidone iodine solution and rinsed with saline solution. Bone fragments were removed from the fracture site and the edges debrided. Three fracture lines, in excess of 10cm length were present in the plastron, radiating from a central plastron deficit. The plastron moved freely at the fracture site with the weight and movement of the turtle. In order to immobilise the fracture screws were placed each side of the fracture. The screws used were sterile 12 mm self-tapping 316-grade stainless screws. A 2 mm pilot hole was drilled prior to fixing the screws. Whilst applying pressure to the plastron either side of the fracture, 30 G stainless steel wire was wound between the screws reducing the fracture gap. A single layer of sterilized fibreglass cloth, impregnated with freshly prepared, rapid polymerizing epoxy resin was used to cover the implants and fracture site (Fig 2). To prevent resin entering the deficit the fracture lines were packed with Dexpanthenol cream. When tack-dry, a second mix of resin was applied, this time including microfibre filler. This enabled the screw heads and entire repair to be planed smooth and prevent the repair fouling on any underwater structure. After curing, the turtle was put in a controlled enclosure maintained at 26ÅãC and treated with Ceftazidime 20mg/kg IM q 72 hr for 2 weeks. Initially positive buoyancy and distress were so severe that the turtle was unable to be contained in tanks, and was kept in a greatly reduced area to restrict movement and possible self-injury. After 14 days, transfer to standard quarantine tank was achieved without undue stress. Regular blood examinations are ongoing, to monitor any adverse changes. To date apart from a mild increased stress related CK level at the first blood sampling, the haematology and biochemistry results have remained within normal parameters. The turtle is currently self-feeding aggressively on a diet of squid and mixed vegetables. Positive buoyancy is still a challenge, but appears to be reducing slowly. The turtle will remain in captivity until this is resolved. At that time it is hoped to release the turtle, which is an ideal candidate for post-rehabilitation survival and satellite telemetry studies. 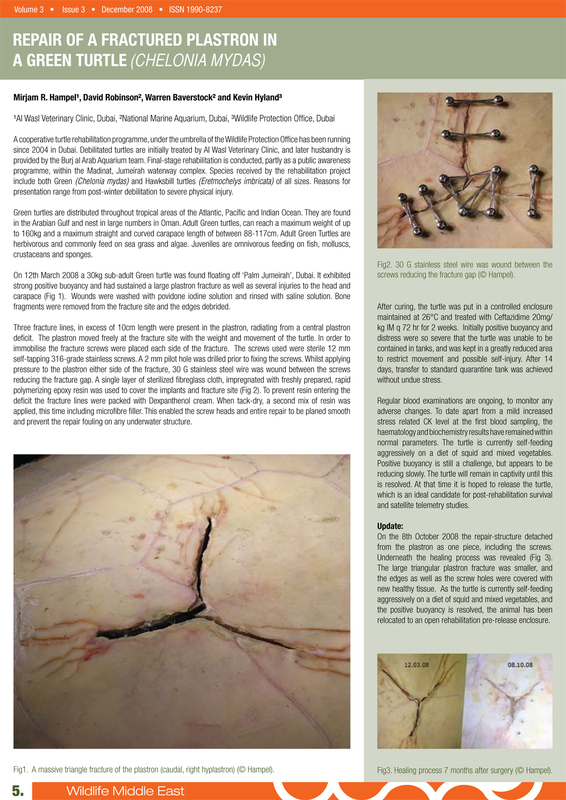 Update: On the 8th October 2008 the repair-structure detached from the plastron as one piece, including the screws. Underneath the healing process was revealed (Fig 3). The large triangular plastron fracture was smaller, and the edges as well as the screw holes were covered with new healthy tissue. As the turtle is currently self-feeding aggressively on a diet of squid and mixed vegetables, and the positive buoyancy is resolved, the animal has been relocated to an open rehabilitation pre-release enclosure.